7th International Symposium & 29th National Conference on Operational Research, Chania, Crete, Greece, June 14-16, 2018. The 7th International Symposium & 29th National Conference on Operational Research will be co-organized by the School of Production Engineering and Management of the Technical University of Crete and the Hellenic Operational Research Society (HELORS). The conference will be held at the Mediterranean Agronomic Institute of Chania, Crete, Greece, June 14-16, 2018. The purpose of the Conference is to disseminate recent scientific advances in the field of Operational Research and Management Science in Greece and to promote international co-operation among researchers and practitioners. The specific aim of this year’s Conference is to highlight the role and importance of OR, new technologies and innovation in agriculture and tourism. Proposed workshops and special sessions will be held during the conference days. March 31, 2018: Abstract submission (max 300 words). April 20, 2018: Notification of acceptance. May 15, 2018: Short papers (5 pages) submission. May 21, 2018: Early registration. Publication: Book “Marketing in the era of Social Media and Big Data: New Trends and Applications”, Springer. Special Issue on "Assessing risks and uncertainties of low-carbon transition pathways", Environmental Innovation and Societal Transitions, Elsevier. 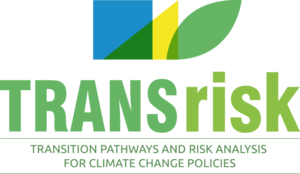 Workshop support: The TRANSrisk project.